Appropriately named for its eco-friendly qualities the Green Chalet is proof you don’t need to sacrifice luxury to be environmentally friendly. With three private bedrooms, two queen beds and one king (or two twins) bed and a sofa bed in a semi private loft, the Green Chalet is great for larger families. The spacious and fully equipped kitchen with beautiful granite counter top, two full bathrooms, and laundry facilities in the Green Chalet provide the comforts of home during longer stays. The Green Chalet includes a large flat screen TV, books, board games, DVD`s and DVD player, iPod docks and a wood burning stove. The elevated, partially covered deck is home to a BBQ and an eight person hot tub with the most amazing views of the Purcell Mountains. The Green Chalet also has ample parking space to easily accommodate RV`s and trailers. The Green Chalet & Sun Suite are an over/under configuration. If you’re looking for more BC Rockies chalets, please browse all of our chalets. The Cedar House Chalets are unlike any other specialty accommodation in Golden, BC, featuring luxurious chalets with striking mountain views. Retreat to a spa-like experience in your amenity-filled chalet which includes your own private hot tub, terry cloth robes and white linen duvets. We invite you to make yourself at home in your fully equipped kitchen complete with a BBQ on the deck and a relaxing wood burning fireplace. Your mountain memories begin at the Cedar House. 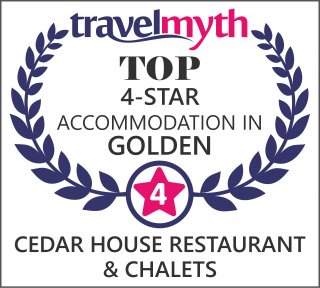 The fine dining Cedar House Restaurant is awarded one of the “Top 50 Places To Eat in Canada” for 10+ consecutive years by the National Restaurant Guide and holds a top rating for “Restaurants in Golden, BC.” on TripAdvisor.com. The Cedar House Chalets operate year round. Office Hours are 10:00 am to 5:00 pm. Phone for chalet availability and current specials at 250.290.0001. Cedar House Restaurant is open for dinner Thursday – Sunday at 5:00 pm and 7 days a week during the summer. Please call to make a table reservation at: 250 344 4679.